BRYAN EATON/Staff photo. Kyle Dundon in a "sonotron" built by associate professor of Interactive Media at Becker College, Derek Hoffend who was a guest of Inventive Labs and CI Works in Amesbury. 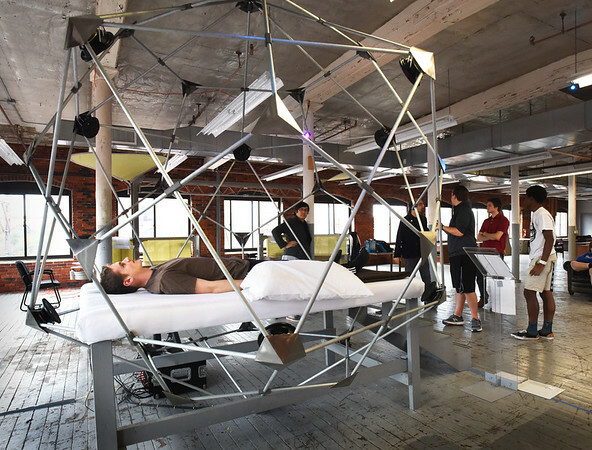 It is a "sound-sculpture and light installation based on audio immersion, sacred geometry, and therapeutics, wherein viewers can enter the piece and be bathed in frequencies."